When my son was about two and a half we moved him from a crib to a big kid bed. After that transition, he never really napped again (not that he was a super duper napper before then). I struggled with him for a few weeks to try and encourage him to nap... but then realized he didn't need a nap, but I needed nap time. At that point I was eight months pregnant with my daughter and I used "nap time" each day to relax, catch up on chores, and often would take my own nap. Since I am a strong believer in kids knowing how to play and create independently, I decided to introduce my son to the concept of "quiet time" so that we could both get the rest/break/creative time that we needed. As a special education teacher I spent a lot of time training my students to work and play independently, so I attempted to implement some of the same strategies as I taught my son how to play independently for his quiet time. 1. Establish a regular time each day for quiet time and try and be consistent. My son currently has quiet time in his room while my daughter has her afternoon nap. She typically goes down between 12:30-1:00pm. Both kids go into their rooms around the same time and I encourage my son to play quietly until he hears his sister wake up from her nap. If she sleeps for longer than two hours then he will often come down and see me before then, but sometimes I have to go and interrupt him to tell him he's done. Before my daughter was born I was less consistent about quiet time because we would sometimes go and play with friends instead or go off on adventures. Now that my daughter actually needs a nap, I am more consistent with my son... which has made his quiet time much more successful. As he practices playing independently each day, he gets better and better at it and can sustain it for longer. 2. Keep it short and make it positive. We started quiet time off by having it happen in shorter increments. He would play for 10-15 minutes and I would check in on him to tell him what a great job he was doing being quiet, being creative, and playing independently. Often during our check-ins I would ask what he'd already played and make suggestions of other things he could try or possible extensions on what he was already doing. 3. Give suggestions or choices of activities. We aren't home that much and my son doesn't play that much in his room, so quiet time is extra special for him. He loves exploring the toys that are kept in the cupboards, building with his Legos, or dressing up. Many people don't keep toys in their kid's bedrooms, but we do. We may have to re-evaluate when my daughter gets older if she is different, but my son is very rules based, so he doesn't ever try to play with toys after bedtime, so we haven't had a problem keeping them in his room. If your child doesn't have toys in their room, you could have quiet time in another part of the house where there are toys, or you could have specific activities set up in your child's room for quiet time and then remove them afterwards. Jenae at I Can Teach My Child shares her quiet time boxes here. Some kids just read books and do learning activities/puzzles during quiet time and don't play with toys. Do whatever works for you and your child. We created a simple quiet time poster to put on the back of my son's door (above). It helps remind him of the activities and play "tools" that he has available to him during quiet time. He told me the activities to put on the list and when we first started doing quiet time he would give me a play by play every day of what he did (pointing at each item on the poster in order)... once he was done with his free time. I loved hearing about how he spent his time... and I thought it was a great conversation activity for strengthening his memory and working on sequencing too! 4. Practice quiet time activities during other parts of the day. After we created our quiet time poster, we spent time during the day using the play "tools" on the poster and came up with a variety of fun ways to use them. We created train tracks using all sorts of materials, made train stations, read lots of books together, dressed up in costumes based on the books we read, practiced cooking new foods in the play kitchen, created towns for the cars to drive around and race car ramps, and built all sorts of structures with the Legos. When we practiced, I would play with my son for a little bit and then let him continue the play independently to help him get used to creating on his own. When we practiced I also tried to use less language and not interact as much socially so that we were creating side by side and he wasn't dependent on me narrating our play or chatting with him. 5. Set expectations ahead of time. Decide what your quiet time expectations are ahead of time and make sure your child is aware of them. 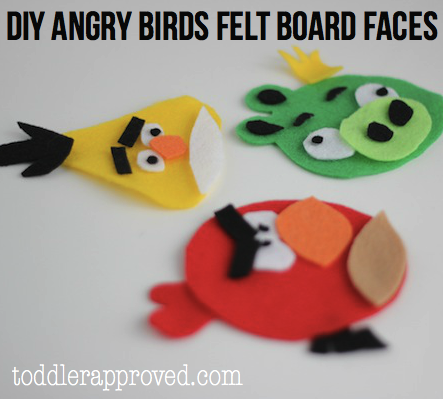 You could post them in their room in a visual way if that is easier for them. Our main expectations are that my son has to 1) stay in his room, 2) come downstairs if he needs something (instead of yelling), and 3) play mostly quietly- he has no ability to be silent (no banging loud instruments or singing really loud). He usually has lunch right before quiet time, so he isn't usually hungry. Sometimes I will give him a baggie of fishy crackers to have with him though if he is still hungry. We also have him take care of bathroom business and drinks ahead of time, but are pretty flexible with that as long as he is quiet. After all, I get to get a snack and go to the bathroom during my quiet time... right? 6. Be realistic and flexible. Some days will be better than others... especially as you are starting out with quiet time. Each child is different, so this will work better for some than for others. A child who already likes to spend time alone might be willing to play independently all day while a more social child really can't handle the quiet for more than an hour...if even thirty minutes. Figure out what works for you. I like to have time alone without any kids in the same room with me. Some parents don't mind having their kids have quiet time sitting next to them or creating at the kitchen table while they wash the dishes. I do believe that kids need to cultivate the skill of creating and playing independently, without constant adult interaction, and I think this is an important developmental skill to help them in school and later in life. With the way that we use technology to entertain ourselves these days, many teenagers and adults physically can't sustain an independent activity without checking their phones every few minutes. I think that kids who have free time alone to use their imaginations each day will ultimately be more creative and happier. I am AMAZED at some of the crazy things my son comes up with when he is off having quiet time. 7. Spice it up a bit. Don't have your child play with the same boring toys or read the same books each day. 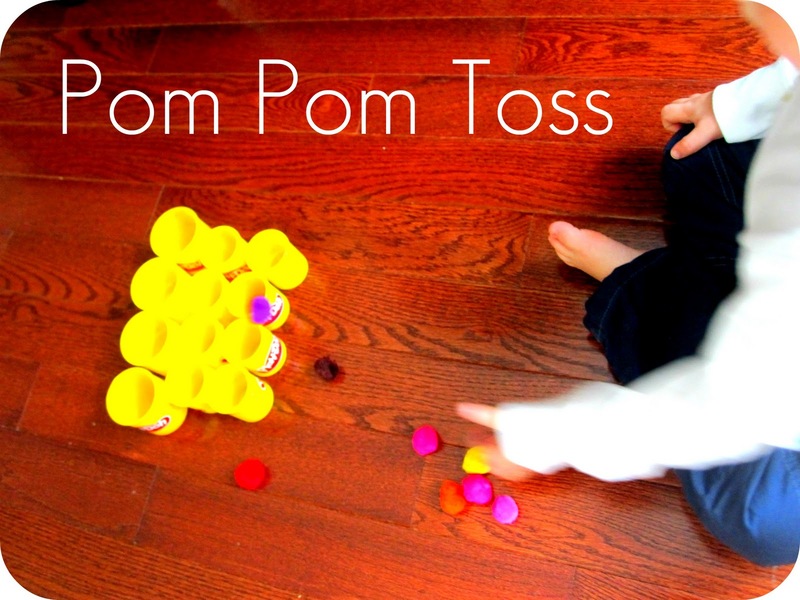 Rotate toys around, make new (or older ones) accessible, and create other fun and interesting activities for your child to do... especially if they have a hard time knowing how to spend their quiet time. My son is typically fine trying on costumes and creating super hero scripts for his entire quiet time without any suggestions from me, but sometimes I will still put some new activities into his room to have him try them out. Below are a few activities that could easily be introduced to your child and then be turned into quiet time activities. If you have a regular successful quiet time at your house, what are your tips? When did your kids stop napping? 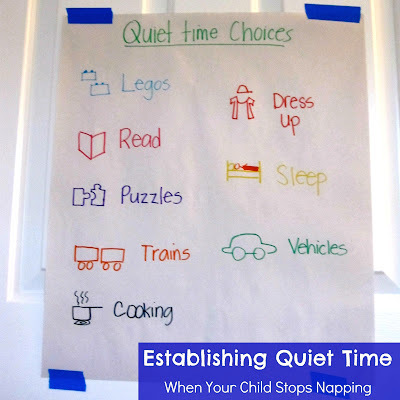 What are your kid's favorite quiet time activities? 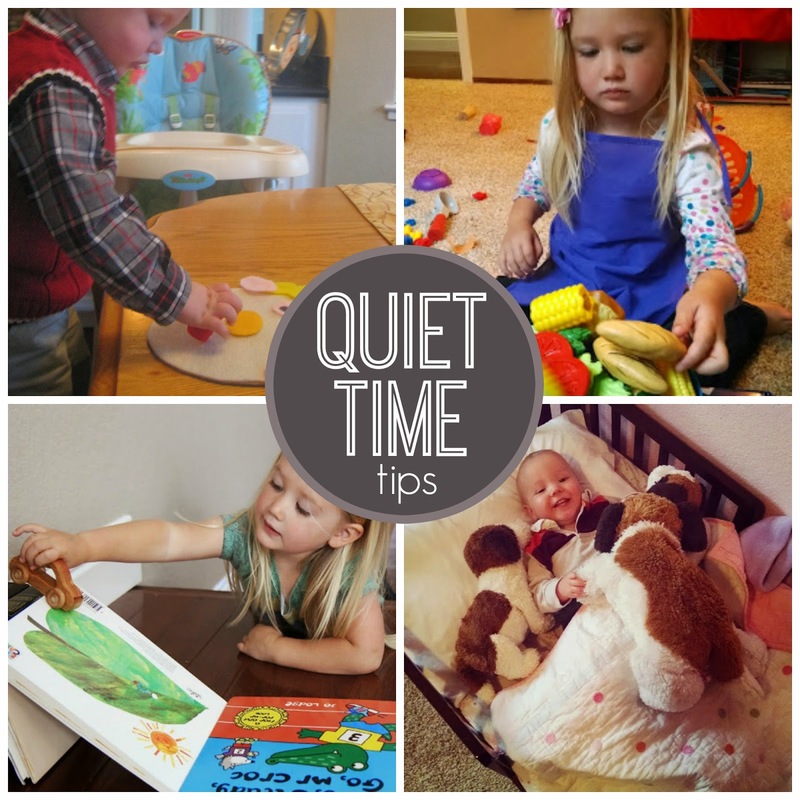 Do your kids need a more structured quiet time or do they prefer free play quiet time? Do you have a baby or toddler? 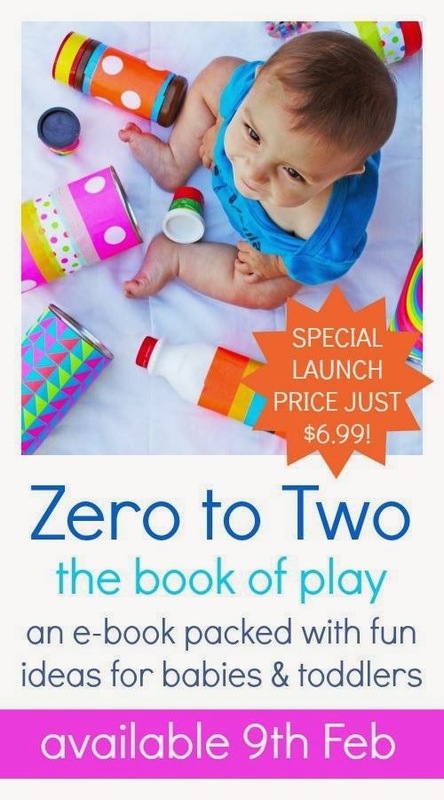 Check out my new e-Book Zero to Two: the Book of Play for more ideas for keeping little ones busy learning and having fun. Thank you so much for posting this. My.daughter is 2.5 and she.is refusing to nap and I so need nap time. Lol. This.makes.so much sense and so.easy. so thank.you. So glad to be helpful! Hope it works well for you Raquel. We have had quiet time since our oldest (now 15 1/2) stopped napping! (And now he sometimes naps during quiet time!) With 6 kids it is sometime difficult to enforce the 'stay upstairs' when each one has a question, because we end up with multiple (read MANY) trips down to mom. After a couple, i warn them that we will extend our time if i keep seeing them. I too use the time for things like doing bills, grading papers, and just resting. Its my time to regroup and recharge...and as i tell the kids, its a time for us all to have a break from each other and a little space. They are in their rooms for the first half, and anywhere upstairs (rooms, play room) for the second half. They do play with each other during quiet time but they do spend time alone as well, if they need it. It really is a nice break for all of us. One comment is, as the kids get older and have activities that happen in the afternoon, you have to decide if you then come home and have quiet time or just skip it. OH! and on the weekends it is time for my husband and i to have lunch together, play a game, talk - its 'date night' during the day, right at home! Yes! My husband and I love quiet time on Saturday for "us time." I definitely agree that once you add more kids and activities your ability to be flexible with quiet time changes. I am enjoying my break while it lasts :) I will be so sad when I turn into carpool mom. I love the idea of date night in the afternoon! What a great post! My 22 month old twins are still napping but i fear one will phase out naps sooner than the other and i am all for quiet time. Worked well with my now 16 yr old and she always knew it was time to just read stories or play with her quiet time boxes! Sometimes she even fell asleep which was bliss! LOVE THIS ONE!!! My kids are 5 and 6. Naps ended when Kinder started last fall. Because my son gets out of school right in the middle of what used to be their nap time it was kind of forced ending. They were ready anyway. Thanks Jill! Once you get started during the summer you'll have to pass along tips! What great ideas! My son (20 mo.) doesn't nap consistently. Thanks for all of the strategies for keeping up with quiet time. Right now if he doesn't nap he usually lies in his crib for about an hour and I hear him chatting with his bear. :) I'm sure he won't be doing that for much longer. Thank you, thank you, thank you! This is something we are struggling with right now. I've been trying to implement quiet time since napping has dwindled but it hasn't been very successful. Getting my three year old to play by herself is a challenge. She really likes adult interaction. I'm going to try to make quiet time more planned for her so I can have some quiet time! those are great ideas...i always feel guilty to make them do quiet time coz they always say "play with me mommy" but i realize it helps them build independence right? but i have two non napping kids so they stay most parts in the play room or their bedroom.. and i try to tell them to play by themselves coz i have a list of chores to do.. i interrupt when their playing turns into "screaming/non sharing/" but give them alone play time or activities.. I just came across this and am glad I did! My son is 4 1/2 and is just now phasing out of taking naps. I'm also expecting our 2nd child in a few months and I think these are great ideas for my son while I have to nurse the baby or rest while the baby is sleeping. My son like to look at books or play with toys that don't make any noise. He also loves "drawing" on any notebook he can gets his hands on. He does very well with free play and I am thankful for that! Thanks for sharing!! thanks you so much for this ..very nice ideas and small kidsdont feel alone during parents work time..
What a great article! It popped up on my Facebook timeline today, and as my son (3) just realized that playing is sooo much more interesting than taking a nap, I wanted to establish a quiet time anyway. Your tips will surely help me to get going, thanks a lot! Once we've gotten a good repertoire of independent activities then we start have short quiet times. As mentioned in my post I keep them short and go and give lots of positive praise. I don't typically start quiet time until my kids stop napping and are closer to age 2.5/3. At age 2 you might want to find some calming activities to do alongside your daughter and transition them to independent activities as she grows. Some moms put together quiet boxes for their kids with activities that they pull out only at quiet time. 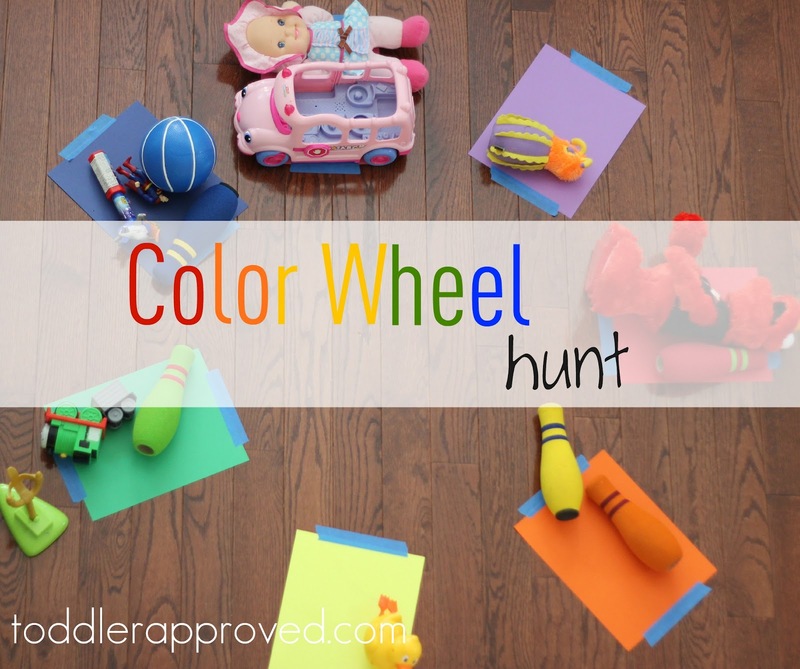 Typically when my kids are hyper we pull out playdough or other sensory play activities that can be calming or we do heavy work activities or active outdoor play activities. If your daughter is hyper after her lunch, show, and nap I would head outside to a park and get energy out for a few hours! Although it is exhausting, 2 year olds aren't made to sit still. You may want to look at your schedule and see where you can add in additional outdoor or active energy bursting activities and then balance those out with calm/downtime activities.